An American student managed to film two planes being struck by lightning within a matter of seconds over Seattle. The bolts went straight through the aircrafts’ fuselages and both were able to land safely. Owen Craft, a student at the University of Washington, was out on a routine trip to film lightning bolts. However, he got more than he bargained for as he filmed not one, but two planes getting zapped. “I was in shock, I was just thinking about how it was so amazing to see,” Craft said, speaking to the Seattle based KOMO News. There was a bit of luck involved for Craft, as he managed to get a close-up of the aircraft just at the right time, after spotting it in the stormy skies. “So I zoomed right in, and just as I did, the lightning struck right across the plane and I was just stunned,” the student added. Miraculously, no one was hurt and both planes were able to land safely. Shelly Lubahn, who was traveling on a Houston to Seattle flight, described the feeling after the plane she was traveling on was struck. “It was lightning. It wasn’t just a bright light – it was the zigzaggy bolt. It looked like it hit the wing and at the same time there was a big loud pop and the guy next to me was like ‘oh my gosh.’ There was just this pop – like the whole plane made a loud pop,” she told KOMO News. "It was alarming, but it was so quick, people knew something happened, but no one knew what," he said, speaking to the Seattle-based station. "It was a direct hit and five seconds before and five seconds after [it was] smooth sailing, there was no turbulence." He said the plane landed without further incident. 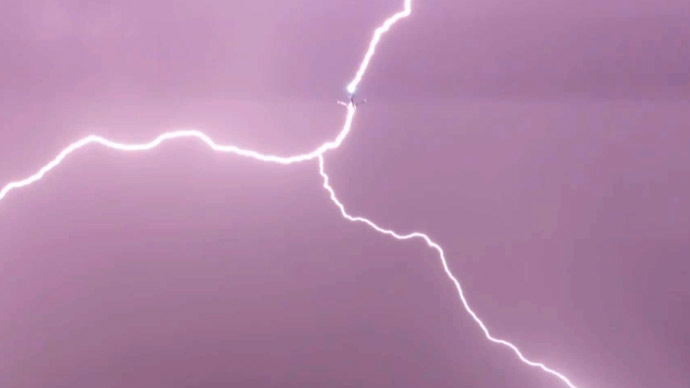 According to Professor Manu Haddad, who works at Cardiff University in the UK and is an expert in how lightning impacts airplanes, said aircraft get hit by bolts from the blue more often than one would think. "On average, every commercial aircraft is hit by lightning once a year," said Haddad. "It is routine for an aircraft to land as soon as possible after a strike, but this is a precautionary measure. Lightning is extremely hot – up to 30,000C. The typical damage is a scorch mark where the point of contact was, usually a wing-tip. The plane's electronics are well shielded these days,” he added, as cited by the Guardian.